As I was doing some searches on Google today, I noticed an interesting change to the way search results are displayed. Do you notice what I noticed? If you look closely, you’ll notice that the URL is now appearing under the title instead of underneath the body copy. This format is being used in both the organic and paid search results. I’m not sure how I feel about it. It looks okay on the organic side, but looks unusual on the paid side. Maybe it’s because I’m so accustomed to seeing the URL at the bottom of the ad and not directly under the title. I couldn’t find any mention of this change on the Adwords blog, but it seems to be a change affecting all searches. Is the title even more important than before — because the URL “cuts off” the body copy and leaves it floating at the bottom? Does it make the URL more important? Or does it favor brands with more well-known URLs? If you have any thoughts or data, please share it below. Thanks! About the Author: Ryan Healy is a direct response copywriter and BoostCTR writer. Since 2002, he has worked with scores of clients, including Alex Mandossian, Terry Dean, and Pulte Homes. He writes a popular blog about copywriting, advertising, and business, and is the creator of the world’s first trust seal for affiliate programs. Ryan, here's Google's post on this: http://adwords.blogspot.com/2011/05/showing-display-url-domain-in-headline.html It seems fairly inconsistent when its showing up except for very large spends; so its not really been possible to see the CTR implications of this change yet. Thanks for the info, Brad. I just checked out the link, and I think we're talking about two different things. 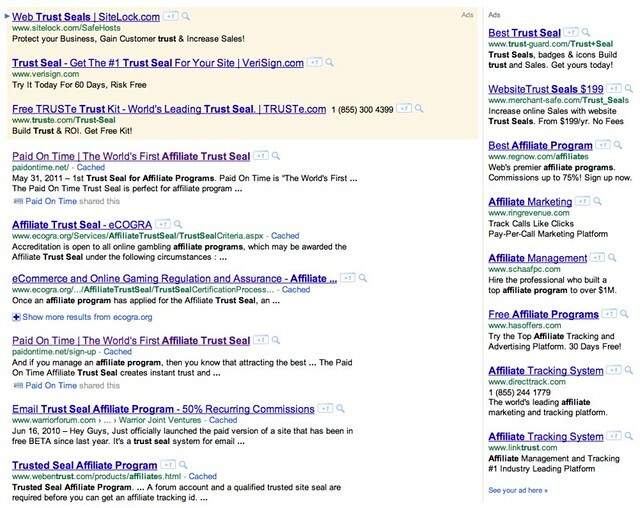 One is where Google adds the domain to the title field of paid ads automatically. I can see that in the top three ads in the image I posted above. But the change that caught my attention is how Google is displaying the green URL under the title -- and before the body copy -- instead of putting the URL at the bottom. This change is affecting organic and paid search results. Oh - good eyes. I've been seeing that; but it didn't register that its new. I've gotten so accustom to seeing some of those other options at the bottom of snippets; I missed the fact that the URLs had moved. ﻿Well it was an incredibly good article.Thanks for posting such an info here.I am hoping you're going to keep on enlightening individuals in future as well,with the help of this kind of useful information.Keep up the brilliant work. Nice post. I learn something totally new and challenging on sites I stumbleupon everyday. It's always interesting to read content from other authors and practice a little something from other web sites.